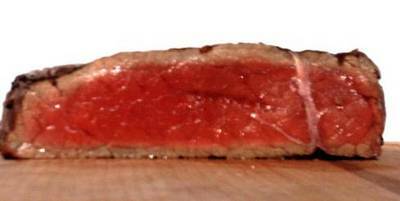 When you go to a restaurant and order a steak, do you prefer it medium well or even rare? If so, you could be putting yourself at risk by eating undercooked beef. Food contamination can cause serious illness or even death in some cases. The best way to ensure that you aren’t a victim is to cook out the toxins and other contaminants that can cause problems. Here are some health issues you should know about undercooked beef, so you can protect yourself. Salmonella is often associated with undercooked chicken, but undercooked beef can also have this bacterium. The symptoms of salmonella can begin to occur as soon as 12 hours after eating contaminated food, but they may not even start showing up for three days. Salmonella is characterized by severe abdominal cramps, diarrhea and other digestive problems. You may also experience a fever as a result. If your symptoms persist for more than seven days or if they are very severe, you should consult with a physician to avoid any serious issues. Food contamination can often result in E. coli poisoning , and undercooked beef is one of the most common culprits of this problem. If the beef that you eat contains E. coli bacteria, you will start experiencing symptoms like vomiting and abdominal pains. You may also have extreme diarrhea which may even be bloody at times. These problems can persist for as long as seven days after ingesting the bacteria. This is one of the less common but still serious things that can happen when you eat undercooked beef. As with the other illnesses that can occur from eating contaminated food, listeria can cause diarrhea and stomach pains. However, there are also symptoms like fever and muscle aches when you contract this bacteria. Your nervous system may also be affected. You might notice trouble keeping your balance, a headache, stiff neck and other problems. In some cases, it might also cause you to lose the ability to concentrate for a short time. If you want to avoid these problems, it’s best to make sure you don’t eat undercooked beef. When you are doing the cooking yourself, you should make sure the internal temperature of the meat is between 145 and 160 degrees Fahrenheit. You can get a simple meat thermometer to ensure that your beef is fully cooked before you eat it. And if you enjoy eating your steaks rare or medium rare, you could be risking an illness.